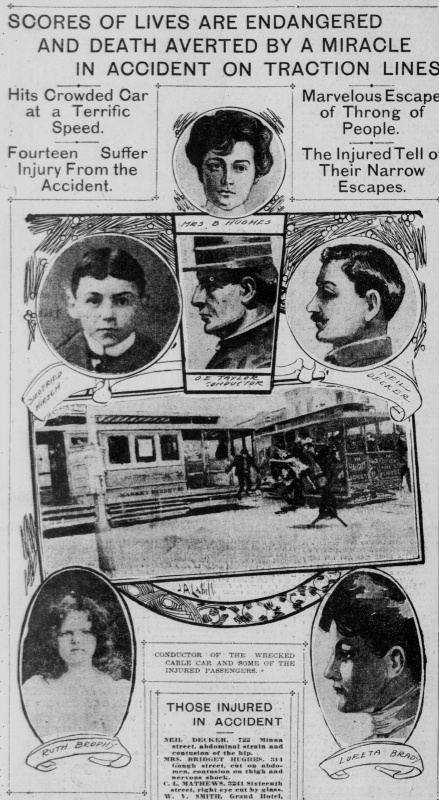 This article, from The San Francisco Call, Sunday, May 31, 1903, describes an accident between two cars of the United Railroads, a Haight Street cable car and a Fillmore Street electric car. We should keep in mind that the Spreckels family, publishers of the Call, were opponents of the United Railroads. The headline and full set of images from an article in the 31-May-1903 San Francisco Call. Newspaper layouts in the early Twentieth Century were often very creative. From the San Francisco Call / Sunday, May 31, 1903. Page 17. Hits Crowded Car at a Terrific Speed. Marvelous Escape of Throng of People. Fourteen Suffer Injury From the Accident. The Injured Tell of Their Narrow Escapes. A southbound Fillmore-street electric car, descending a heavy grade, crashed full upon a west-bound Haight-street car yesterday morning at the junction of Fillmore and Haight streets, wounding fourteen people and demolishing the cable car completely. Had the electric car struck three feet to the right or left of the point where the impact came a score of lives would have been crushed out. That out of the crowded Halght-street car no one is fatally injured is a marvel of fortune. By the rules of the railroad company, both cars should have been brought to a halt before crossing each other's tracks. When the collision occurred yesterday the Haight-street car was squarely on the middle of the Fillmore-street tracks and the car of the latter line was bowling down the grade from Oak street at a tremendous speed. Whether this was a violation of rules or the result of the electric car becoming unmanageable is a question which the traction company must decide. It was at 11:30 o'clock that the west-bound Haight-street car. No. 163. under control of Gripman Fred H. Diehl and Conductor O. E. Taylor, approached the crossing at Fillmore street. According to orders, Diehl stopped his car before crossing the tracks and awaited the conductor's signal to go ahead. At the sound of the bell he caught the grip and the car moved forward on to the tracks of the electric line. Car No. 982 of the Fillmore-street line, under charge of Motorman H. C. Keller and Conductor A. W. Latham, and carrying only one passenger, had meanwhile started down the heavy incline from Oak street. Seeing the cable car in his path, Motorman Keller reversed the current and endeavored to stop the car, but to no purpose. At terrific speed the on-rushing car struck the Haight-street car squarely in the middle. There was a rending crack, followed by the crash of splintered glass and the shrieks of the penned-up passengers within. The lefthand side of the cable car had been bent in like the side of a card house, the floor ripped from the trucks and the seats within rolled up like pasteboard scrolls. Both dummy and interior of the car had been crowded with people. A second after the crash prostrate forms were sprawling in the street many feet from the wreck, while from within the splintered shell came the groans of anguish of those who had been pinned down by the wreckage. To these willing hands began immediately to render assistance. The Sun drug store, on the corner of Haight and Fillmore streets, was turned into a temporary receiving hospital. Dr. E. F. Liebrich and Dr. T. P. Bodkin, the proprietors of the establishment, rendered first aid to the injured until the ambulances from the Central Emergency Hospital could arrive on the scene. A score of people, who did not report their names, were treated for cuts from flying glass, bruises and sprains and made their way to their homes without assistance. Six of the sufferers were taken to the Central Hospital. It was there discovered that Mrs. Bridget Hughes was severely injured. She had been sitting with her husband and little daughter when the crash came and had been thrown heavily and pinned down by the wreckage. She was suffering from a severe strain of the abdominal muscles, a contusion of the right thigh and severe nervous shock. She received treatment from Dr. Stevens and early in the evening was able to be moved to her home at 214 Gough street. C. L. Mathews of 3241 Sixteenth street was treated for a cut on the right eye. W. V. Smith of the Grand Hotel had a sprained right ankle treated. Charles Reinhart of 1609 Folsom street had a sprained wrist which demanded attention. Nell Decker, residing at 722 Minna street, received abdominal injuries and a wound on the right hip. C. F. Lesser of 231 Third street suffered from contusions of both knees and the left leg. All of these were discharged immediately upon being attended to. "Both the Haight-street and Fillmore-street cars have orders to stop before crossing each other's tracks. Acting according to this rule, I stopped my car before crossing the other track and waited for the signal from the conductor. When I started the car I saw the Fillmore-street car about one-third of the way down the hill. Thinking that the Fillmore-street car would stop before the crossing, I moved ahead. The approaching car was coming at a terrific speed, and, although I saw the motorman trying to stop his car, I could see he did not succeed. He should certainly not have been coming at that rate of speed if he knew his business." Conductor Taylor of the Haight-street car, who lives at 705 California street, corroborates Diehl's story. He says that he did not see the Fillmore-street car at the time that he gave the signal to go ahead. Conductor Keller (actually the motorman - JT) of the Fillmore-street car, who lives at 921 Minnesota street, is also a new man on that run. On Sundays and holidays a car is sent over that line from the Potrero direct to the Cliff House, and it was this unfamiliar run which was entrusted to Keller. That he is uncomfortable over his part in the accident is evinced by the fact that he could not be found to state his side of the story after the affair. "We have orders to stop before crossing the Haight-street tracks, but at this instance the car became unmanageable. After the accident Keller told me that he could not stop the car on the grade, although he used every endeavor. I did not see the crash." It is little short of the miraculous that out of the fifty or seventy-five people who crowded the Haight-street car not one suffered injuries which are serious. Despite the jar, the splintering of wood and flying of glass, the most seriously wounded of the lot was not retained in the hospital over six hours. "I was seated on the inside of the car when I saw the other car come crashing down on us. I was not able to move, so frightened was I, but just sat there and watched the car come on. The inside of the car bulged in like paper when the crash came. I kept my feet, but was violently thrown against the side of the car and cut by flying glass." G. F. Lesser of 231 Third street, who had his left knee quite badly injured, met with an exciting experience at the instant of collision. He was standing on the step on the back part of the Haight-street car in company with Spencer Edwards, who also lives at 231 Third street. "The Haight-street car stopped at the crossing of Fillmore street," said Lesser last evening. "Then our bell was rung and our car went on. Just at that instant I heard the bell of the Fillmore-street car and I saw that car rushing down on us very fast. The Haight-street car was full on the outside and all the seats on the inside were filled and I think that one or two men were standing up on the inside. "The steps and all the seats on tho outside were taken. Before I could jump the Fillmore street car struck the one I was on. The crash was something fearful. The air was filled with splinters of wood and pieces of flying glass. The shock was something terrific. The side of the car was smashed in and the people inside and outside of the car were thrown about. Those on the outside were thrown on the pavement. Those inside of the car were hurled against the side opposite to where the Fillmore street car struck. I was hurled to the ground and struck on my knees. Then I was twirled about by the force of the shock and found myself with my head under the Haight street car. I could not get out alone and had to be pulled out by a fat man. When I was out I tried to help the other passengers on the Haight street car to get into the Sun drug store, on the corner of Fillmore and Haight streets. I think the Fillmore street car, when it struck the Haight street car, was going about ten miles an hour." Spencer Edwards, who was standing beside Lesser on the step of the Haight street car when the accident took place, told a similar story of the happening. "There were four or five persons standing on the step where I was. I heard the signal of the Haight street car to go ahead. Then, in the same instant of time, I heard the bell of the Fillmore street car. It was rushing down the hill toward us at a high rate of speed -- how fast I couldn't guess. I saw that it was jump or be hurt, and so I jumped. I fell on the stones and was then whirled around once or twice before I finally dropped. H. Breese was one of those on the rear step. He tried to jump over the back of the car. but had only one leg over when the crash came and he was hurled to the pavement with considerable force. If the car coming down Fillmore had struck just a little later it would have cut off the legs of the people on the rear part of our car. We had a narrow escape from that. I was not much hurt." Among the badly shocked and injured is Miss Loretta Brady, daughter of William J. Brady, of the Eureka Boiler Works, Mission street, who resides in Ross Valley. On arriving in this city Miss Brady took the Haight-street car. At Fillmore street she was shocked by what she remembers to have been a bad collislon, but remembers nothing more of the affair. Miss Brady sustained severe bruises about the body and her nose and face were scratched by the flying glass. Her right wrist was severely cut and the blood flowed from the wound as she was being carried into the Sun drug store at the corner of Fillmore and Haight streets, where Dr. Bodkin attended her. Little Ruth Brophy, niece of Miss Brady, had a miraculous escape from injury. Siegfried Hirsch, 16 years of age, son of Mr. and Mrs. David Hirsch of 533 Haight street, was on the Haight-street car. He says the collision came without warning and he was pitched headforemost from the car to the street. He was picked up by some people and was able to give his address, which was but a few doors from the place where the collision occurred. A child ran to the house and informed Mrs. Hirsch of what had happened, when assistance was procured and her son was taken to his home. His knee was badly bruised and he suffered more or less injuries about the body. MRS. BRIDGET HUGHES. 314 Gough street, cut on abdomen, contusion on thigh and nervous shock. C. L, MATHEWS, 3241 Sixteenth street, right eye cut by glass. W. V. SMITH, Grand Hotel, right ankle sprained. CHARLES REINHART, 1609 Folsom street, right wrist sprained. G. F. LESSER, 231 Third sreet, contusion on knees and left leg. THOMAS WALSH. 3216 Seventeenth street, right eye cut. MISS LORETTA BRADY. 804 Cole street. bruises and cuts. MRS. DR. ELIZABETH HARRIS. 710 Capp street, shock and bruises. MRS. ELLA KEATING, 636 Ivy avenue, bruises on face and arms. JOHN A. BRIGHT, 108 Eighth street, face cut. LOUIS M. ISAACS, 626 Natoma street. left wrist sprained. SPENCER EDWARDS, 231 Third street, legs. strained. H. BREESE, 214 Van Ness avenue, bruises on body. From the San Francisco Call / Wednesday, July 8, 1903. Page 14. This brief item describes the first lawsuit relating to the accident. In the previous articles, Mister Decker's name was given as Neil. Nicholas C. Decker filed suit against the Market Street Railway yesterday for $5000 damages.for injuries received in the collision between Fillmore-street electric car and a Haight-street cable car on the morning of May 30. Decker suffered a wrenched spine, sprained limbs and internal injuries. He alleges he was confined to his bed for two weeks. This is the first suit filed as the result of the accident. Copyright 2008 by Joe Thompson. All rights reserved.